MMA video games are action-packed fighting games that recreate the excitement and intensity of the real-life Mixed Martial Arts fight. Most gamers would agree that UFC Undisputed 2010 has potential to be the greatest MMA video game ever. Ever since the release of UFC 2009 Undisputed I could not wait for the 2010 version to see how they would make the game a bit more realistic. UFC 2009 was a major step from the old MMA games were you couldn’t really have full control of your fighter, especially in the clinch. So on to the latest in the series UFC Undisputed 2010 . First thing to note is the huge roster selection in each weight class (more 100 UFC fighters) to choose from it’s just so vast and with the PS3 version there are even some of the “Old School” UFC veterans to select. Next is the way the fighters look and move in the octagon, This has been improved and all the fighters seem to move, act and re-act as you would expect their real life counterparts. Now to the action, the stand up game is much the same the added improvement of the “Sway” is good but still needs some work, it’s fairly basic and once you get to learn the sway pattern it really easy to ensure your punches connect 90% of the time, also the addition of pushing you opponent against the cage whilst a welcome addition still feels rushed and not quite like the real thing. The clinch is very much the same as before although there is the use of the cage this time. So in summary UFC Undisputed 2010 is an improvement on the last game and you can feel that they have listened and tried to add and change the game to make it as realistic as possible but there is still room for improvement, I would recommend this game for all MMA fans out there. The graphics are UNBELIEVABLE, every fighter looks completely real. And the realism doesn’t stop there, every fighter in the game has fighting styles and abilities that are just like the real fighters. There are also all kinds of new features like the ability to make and play your own pay per view which is so fun if get some friends to play through it and the other gameplay modes that ensure you will never get bored of this game. So all in all, I would highly recommend this game if your a fan of the UFC. Bring your mixed martial arts skills to the octagon again in UFC Undisputed 2010 . You Get To Fight Fedor! 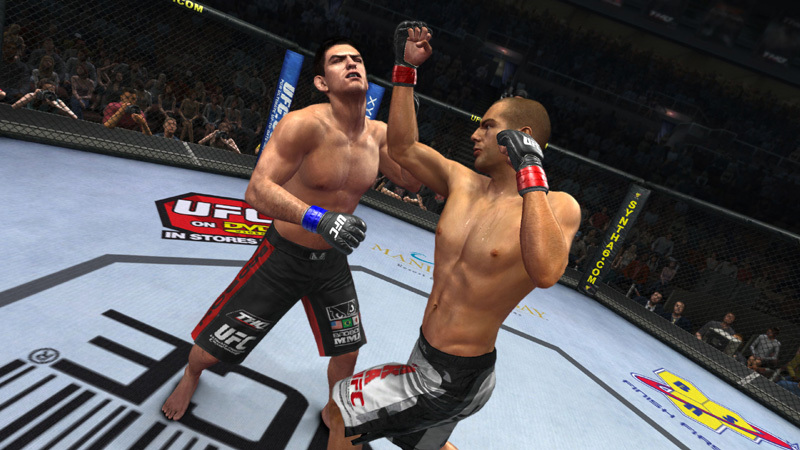 Of course the main competitor for the UFC game is no other than the EA SPORTS: MMA . I didn’t get my hands on this one wet but I will keep you posted. EA SPORTS MMA brings the authenticity of the world’s most intense combat sport home like never before. Choose from the world’s top fighters or climb the ranks of the worldwide circuit with your created prodigy to become the ultimate MMA champion. Travel the globe and learn a multitude of fighting techniques and skills from masters in each discipline. Select from various weight classes, rule sets, and take on all challengers in multiple cage types or a ring. The challenge continues online with the most robust offering for any MMA videogame, including the ability to create and share custom fighters, prize fights, and more. Are you ready? Let’s get it on!